Condition:100% brand new,never been played with. 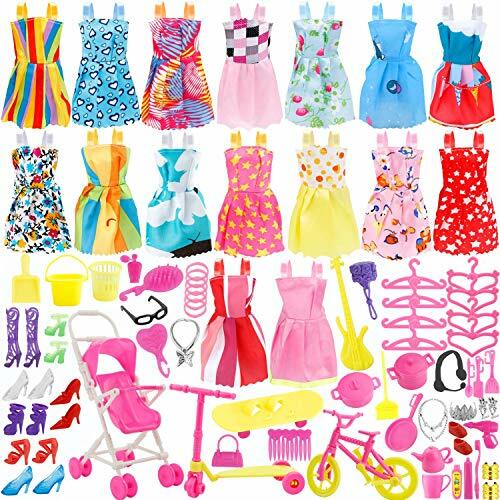 PACKAGE INCLUDES - Total 114pcs - 16 Pack Doll Clothes Dresses Accessory Party Grown Outfits Doll Fashionista(Color Random) + 98pcs Doll Accessories Shoes Bags Necklace Mirror Hanger Tableware ( Not Contain Doll). GREAT FOR VARIOUS DOLLS - Fit for Barbie Doll / Vintage Barbie Doll / Silkstone Barbie Doll / Momoko Doll / Blythe Doll / Pullip Doll / Jenny Doll and other 28CM-30CM Doll(11.0"-11.8"). COLORFUL DRESS STYLES - 16 pcs different style doll princess cloting,rainbow style / love heart style / strip style / dot style, to fit your dolls different outfits. (Random Style). MULTIPLE DOLL FITTINGS - Include Shoes,Tablewares,Necklaces,Classes,Handbags for Barbie Doll,add these for more fun. NOTICE - Baby carriage need to be assemble by kids,train children's creativity,showmanship,practical ability,etc.